Professional money managers like large family offices and pension funds have been using this powerful portfolio diversification tool to increase returns and reduce overall portfolio risk for years. 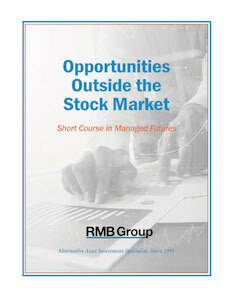 Now individual investors can do the same by downloading “Opportunities Outside the Stock Market—A Short Course in Managed Futures." Written by the RMB Group, this guide is required reading for the serious investor. Barry Potekin, VP of the Rutsen Meier Belmont (RMB) Group Managed Accounts Relations, has been involved in a wide range of commodity research and trading activities since 1985, with an emphasis on client support. 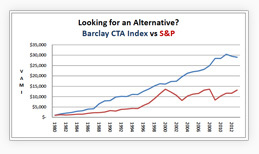 A very popular speaker and teacher, he makes the fine points of alternative asset investing quick and simple to understand. Founded in 1984 to give premier options trading and research support, the Rutsen Meier Belmont (RMB) Group is one of the most respected names in the futures and commodity brokerage industry. The RMB philosophy is to build long-term client relationships, with truly personal service, creative trades and strict risk management.